As a personal chef, my clients consistently ask for healthy menus, and they specifically want fruits and vegetables to be interesting and flavorful. There is also a lot of interest in reducing carbs, so people want a substitute for pastas and grains. 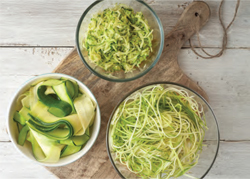 A spiralizer is the perfect tool to help accomplish these goals. 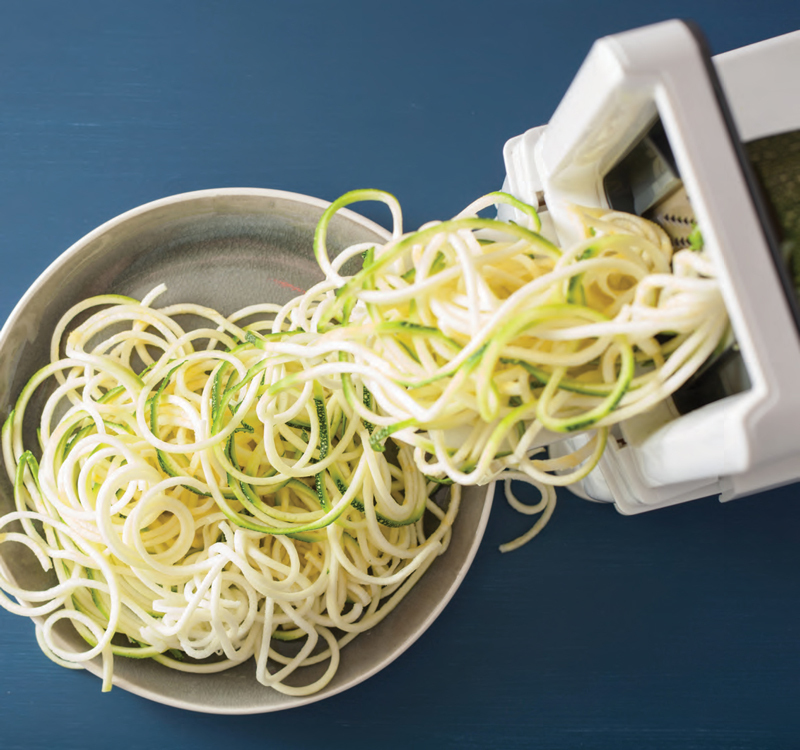 There are many different versions of spiralizers, from simple hand-held designs to attachments you can add to your stand mixer, but they all basically do the same job. There are usually several types of blades to produce a variety of cuts such as spirals, shoestrings, and long ribbons. These add interesting texture to stir fries, pasta dishes and salads. 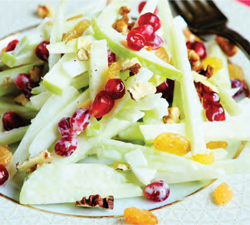 This is a fresh, lighter version of a Waldorf salad, made more interesting with the spiralizer; but if you don’t have one, just cut the apples into matchsticks. For the dressing: Whisk the white wine vinegar and sugar until the sugar is mostly dissolved. Peel the shallot and grate it on a microplane directly into the bowl. Add the poppy seeds, salt, pepper, and ground mustard, and whisk to combine. For the salad: Toast the pecans by putting them on a baking sheet and place in a 350 degree preheated oven for 5 minutes, or until they become aromatic. Cool and chop the pecans. Spiralize the apples and toss them with the dressing and remaining ingredients. Serve immediately or immediately or refrigerate for up to 1 hour. A unique way to serve sweet potatoes, and a perfect accompaniment to grilled chops or steaks. It’s a bit decadent, but the flavor is incredible! 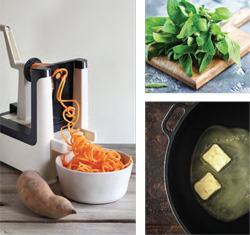 Cut sweet potato into spaghetti-like ribbons, or “swoodles,” with a spiralizer. Toast the pecans in a 350 degree preheated oven until they become aromatic, about 5 minutes. Cool and chop. In a large saucepan over medium-high heat, add diced bacon and sauté until crispy (about 4 to 5 minutes). Remove from pan and set aside. Add olive oil and sweet potato noodles to pan and cook, stirring often and adding more oil if necessary to prevent sticking, until the swoodles start to soften, about 7 to 8 minutes. Transfer to a plate. In the same skillet, over medium-high heat, add 1 teaspoon olive oil and the minced onion. Sauté until translucent, about 2 to 3 minutes. Add the butter and fresh sage leaves to the pan and melt, until the butter becomes foamy. Reduce the heat to medium and cook butter for 3 to 5 minutes, stirring the entire time until the butter turns a golden brown color. Fish out the whole sage leaves to save for garnishing, then add the chopped sage leaves, nutmeg, and parmesan. Stir until the cheese is just starting to melt. Remove sauce from the heat. Toss cooked sweet potato noodles with the sage brown butter sauce, bacon and pecans. Season the swoodles with salt and garnish with crisp sage leaves. An easy, light and low carb version of a popular pasta dish with lots of flavor! Cook the bacon in a large skillet over medium heat until crispy. Reserving the bacon fat in the pan, set the bacon aside to cool and break into pieces. Add the butter to the bacon fat in the pan and melt. Add the onion and sauté for 5 to 6 minutes until softened. Add in the garlic cloves, dried oregano, and the red pepper flakes. Sauté for 1 to 2 minutes, stirring frequently. Stir in the white wine vinegar, and then add the shrimp. Cook, stirring frequently, until the shrimp are almost cooked through, about 3 to 4 minutes. Add the spiralized zucchini, tossing the noodles with the sauce just to coat them and warm them thoroughly. (You want them to be crisp-tender. Do not overcook or they will become mushy.) Remove pan from heat and stir in the lemon juice, bacon and parsley. Season with salt and pepper and serve immediately. Marsha Gale lived in Central Virginia for 19 years before moving to Charlotte, North Carolina. Her lifelong love of cooking, baking, and entertaining led her to begin a culinary business. Meals by Marsha offers personal chef services in Charlotte, with occasional travels to Virginia for special clients. Her mission is to provide tasty, fresh, and nutritious food for people who appreciate good food but don’t have the time to cook.